Being just over the road from our apartment, the three star Mal Maison hotel has been a very convenient place to pop for a quick lunch, dinner, or cocktail. Yet over recent months we’ve used it less and less. Partly this is due to it getting shabbier by the day – the stair carpets are thread bare and the armchairs have stuffing poking out. Also, Cocktails (£9 and up) are produced at a glacial pace which slows down all of the table service, to the point where you can be drink-less for twenty minutes. I thought I’d gone tee-total one evening… It’s a shame given that the quality of the food is as good as ever. We went as a large group for their Sunday roast which is good value at around £15 for two courses excluding wine. This carte d’hôte menu isn’t huge but there is plenty to choose from, and of course there is the à la carte if you get really stuck. Starters on the à la carte are around the £7 mark, with mains about £15, except the grills (steak, burgers) which are between £20 and £30. So it isn’t somewhere to come for a cheapy à la carte dinner. Our starters were delicious. The retro prawn salad was with large crevettes rather than sad little shrimp, and crisp salad leaves not completely drowned in marie rose dressing. As an extra touch the dish was iced like a Fruits de Mer. 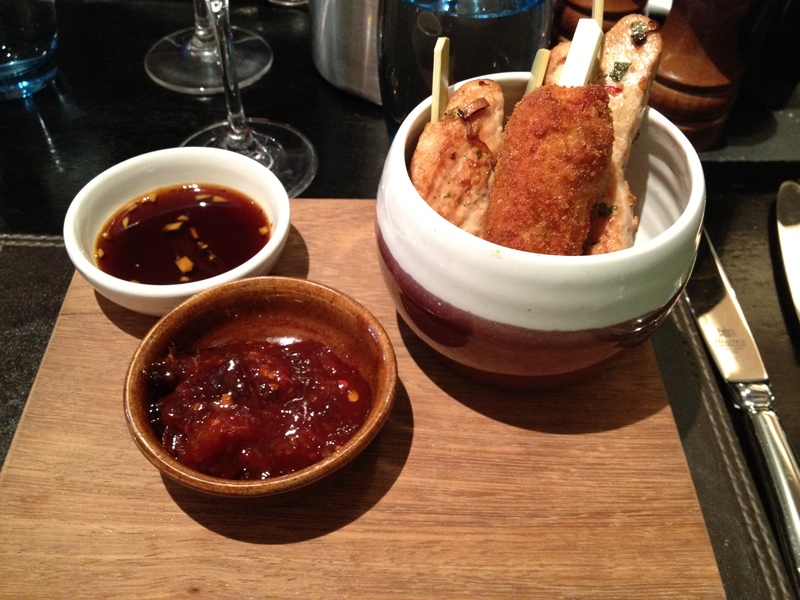 Also bouche-amusing for a starter was a dish of chicken sticks with Asian style dips. The prettiest dish was definately a tuna carpaccio though. The starters were well sized but not huge, so leaving room for the more than ample Sunday roast offering. We had the option of beef or chicken, all served with plentiful piles of veg and roast potatoes and a Yorkshire pudding. The beef was beautiful, cooked rare, and served with a rich shiny gravy. 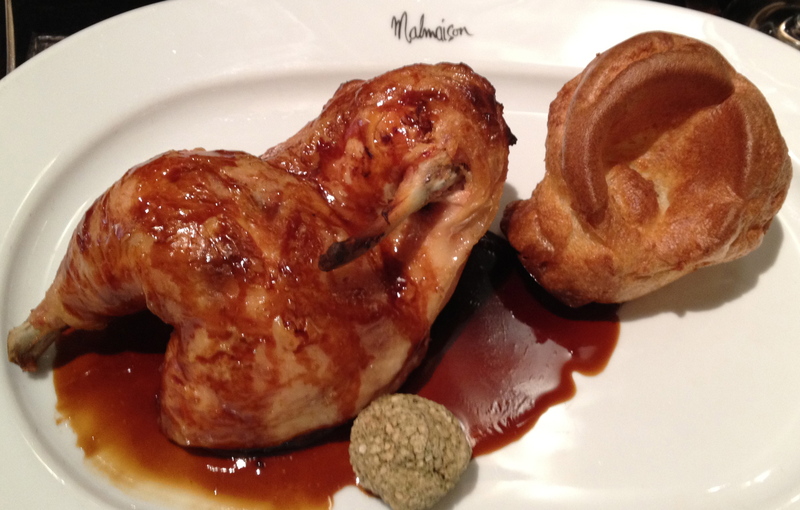 The roast chicken was very large, and well cooked – crispy skin but not at all dried out. On another occasion recently I had the veggie mushroom burger and it was unbelievably rich but most definitely lovely, and worth a mention here. The service is a bit variable I find. Some of the staff are clearly less experienced than others and it shows when our rowdy large group are being demanding. We always tip well to make up for it… Seriously though, sometimes getting multiple bottles of wine, and soft drinks, and tap water at the same times takes a couple of reminders. The wine list is super and the pricey cocktails, once they arrive, are usually well made – and when they’re not, they’ll try and fix it or make it again without being precious. So for me, this is a great place to come for good food and a cosy atmosphere, to have a rowdy and tasty lunch with friends. There are also lots of cosy dark corners for a romantic meal for two. 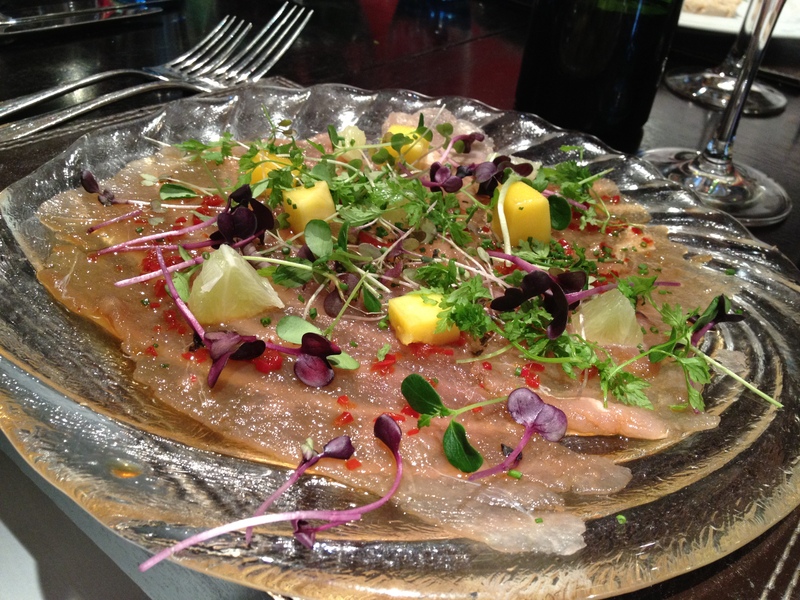 This entry was posted in Area: The Mailbox, Cuisine: English, Cuisine: Modern Mixed, Cuisine: Steakhouse, Price: Get your dad to pay - above average, Venue type: Bar, Venue type: Cocktail Bar, Venue type: Restaurant, Venue type: Wine Bar and tagged birmingham review, mal maison, restaurant review, the mailbox. Bookmark the permalink.